It’s important to clean the coils on your refrigerator a couple times each year. This will help your refrigerator from overrunning. It will also help it use less electricity, be more efficient, and will help contribute to its longevity. Refrigerators have a compressor that forces a cooling substance called -refrigerant through the coils. Evaporator coils in the freezer eradicate heat from inside. This heat is emitted into the exterior through the condenser coils. The coils are thin tubes, some with connecting fins like a radiator on an automobile. A number of coils are supported at the rear of the refrigerator. Others are located under the refrigerator, where a fan ventilates air across the coil. When you stand next to the refrigerator you can feel a breeze by your feet, the is a indication the condenser coil and fan is working. As the exterior condenser coils become dirty, they are not as efficient at transferring heat. You will be shocked at how much dust has collected on the coils. To clean the coils, first locate them. First, unplug the refrigerator and pull it out and away from the wall (on built-in models, turn the circuit breaker off). On older-model refrigerators, the coils are exposed on the back. On newer models, the coils are under the refrigerator, hidden behind a cover panel or kick plate. The next step is to remove the cover or kick plate. On some models it’s held in by spring clips; on other models there may be a couple of small screws. It’s best to use the long, narrow attachment of your vacuum to clean any build up and dust on the coils. If you have the an older model clean the back-mounted coils with the upholstery brush vacuum attachment. If you don’t have such an attachment you can even buy a coil cleaning brush at a hardware store. For any stubborn build-up use warm water and dish soap to remove any dust using a soft cleaning brush. When finished, simply replace the cover panel or kick plate, then slide the fridge back into place and plug it in (or flip the circuit breaker to on position). As you can see, cleaning is simple. Tip: If you have pets, you need to clean the coils at least every 120-days. 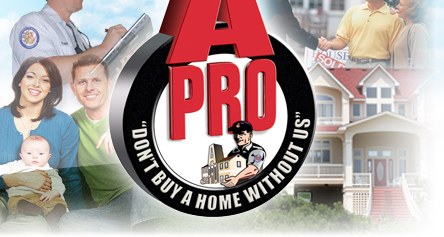 Any questions at all, just call your A-Pro inspector today. This entry was posted on Thursday, September 6th, 2012 at 1:05 pm	and is filed under Top Salt Lake City Real Estate Agents. You can follow any responses to this entry through the RSS 2.0 feed. Both comments and pings are currently closed.